The increasing emphasis over preventive healthcare, nowadays, has prompted consumers to pay close attention to their everyday nutritional intake, which is reflecting significantly in the uptake of nutraceuticals across the U.S. Preventive healthcare involves the usage of products that can assist in the prevention of various diseases and medical conditions. Of late, the focus has shifted from the treatment of diseases to the adoption of several daily measures that can reduce or prevent the onset of chronic and lifestyle-related conditions and diseases. As nutraceutical products are stocked with nutritious ingredients, their demand is shooting up, leading to a substantial rise in the U.S. nutraceuticals market. Apart from this, the increasing consumer preference for high-protein diets with natural ingredients is also aiding the market for nutraceuticals in the U.S. Over the coming years, the surging sales of plant derived proteins, such as soy and pea protein and the fueling demand for herbal supplements and omega fatty acid enriched functional foods are expected to boost this market remarkably. However, the imminent market saturation of the key products may impact negatively on this market in the years to come. 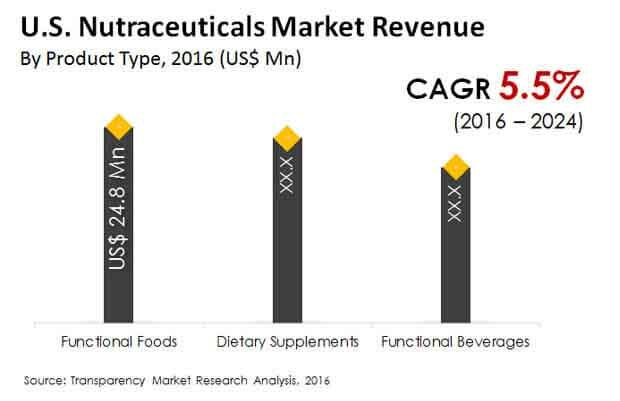 The U.S. market for nutraceuticals stood at US$64.8 bn in 2015. Progressing at a CAGR of 5.30% between 2016 and 2024, the market’s value is estimated to reach US$102.6 bn by the end of 2024. Functional foods, functional beverages, and dietary supplements are the main types of nutraceuticals available across the U.S. Functional foods enjoy a greater demand from consumers, thanks to the high awareness about the positive impact of functional foods on human health and the subsequent increase in the demand for natural products. Although the demand for functional food products is likely to remain strong over the forthcoming years, the functional beverages segment is anticipated to make the most significant leap in terms of the demand, rising at a CAGR of 6.10% from 2016 and 2024. The demand for dietary supplements is also expected to witness a healthy progress in the U.S. over the next few years. The advent of herbal supplements, such as ayurvedic extracts, plant extracts, algal extracts, and phytochemicals, and the increasing inclusion of mineral and vitamins in the daily diet of consumers are projected to support the growth of this segment in the near future. Nutraceuticals are available in tablet and capsule, liquid, powder, and solid/semi-solid forms all over the U.S. Among these, the liquid nutraceuticals segment led this market in 2016 with a share of 34.8% and is expected to remain on the top over the coming years on account of the increasing adoption among consumers. Nutraceuticals in other forms, such as tablets and capsules, powder, and solids/semi-solids are also projected to experience an upswing in their demand in the near future with the augmenting consumption of nutraceuticals fueled by the rising level of awareness among consumers in this country. With a large number of participants, the U.S. market for nutraceuticals demonstrates a highly fragmented and competitive landscape. General Mills Inc., The Nature’s Bounty Co., Amway Enterprises, Herbalife International Inc., Royal DSM NV, Pepsi Co., Groupe Danone, Bayer AG, Abbott Laboratories, and Chobani LLC are the most prominent vendors of nutraceuticals across the U.S.